← Think we really know about any public figure? 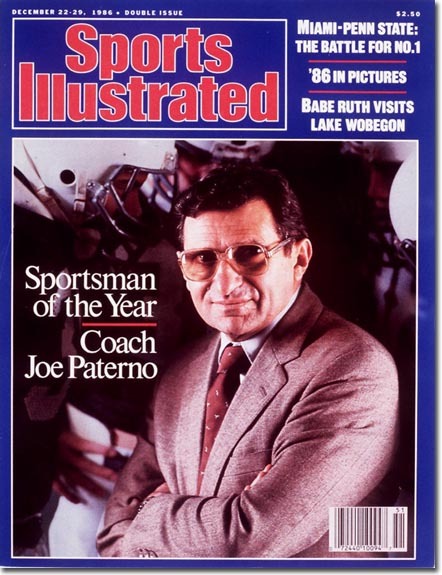 The 1987 cover story was written by Rick Reilly, a writer I enjoy. The point is not that Reilly is, or was, a fool. After all, in theory no one could have known then. But that is the point. As this year’s Sportsman of the Year, we choose a tenured professor who wears glasses thicker than storm windows, a jacket and tie, white socks and pants legs that indicate continual fear of flash floods. He goes about 5’10”, 165 and looks less like a football coach than a CPA for an olive oil firm. But legends have a confounding habit of showing up in strange shapes. And a funny thing happens when this one starts to say something. Two-hundred-eighty-pound linemen, college presidents, NCAA honchos, network biggies and even your basic U.S. vice-presidents cross-body-block one another to get near him. Good thing, too, because Joe Paterno, the football coach at Penn State University, can teach you some of the damnedest things. Who focused on the “try” at the time? Whenever I come across this type of hagiography in the future, I won’t have to try to remember Jerry Sandusky’s crimes and the lack of heroes in its trail. Which should remind me that the type of people actually worthy of such praise do exist, but their priorities don’t include currying favor with the media and its hagiographers. The lesson I draw: The anonymous person in the next pew is more likely to be a real hero than the person featured in the newspaper or magazine article. That was true yesterday, today and tomorrow. That’s the Good News. This entry was posted in Random Observations and tagged Hagiography, Jerry Sandusky, Joe Paterno, Rick Reilly, Sports Illustrated Vault. Bookmark the permalink.